Nomadix is a wholly owned subsidiary of DOCOMO interTouch, focused on providing solutions to the public Internet access market. 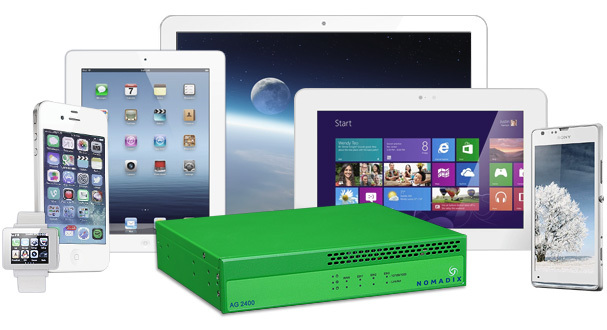 Nomadix sells a range of Internet access gateways powered by the Nomadix Service Engine (NSE) software to Public Access Service Operators (PASOs), Service providers, System Integrators and venue owners who are deploying public internet access networks, visitor based networks and metropolitan WIFi Hot Zones. Depending on the size of your user base, you can deploy a visitor-based network or a metropolitan Wi-Fi Hot Zone with the NSE. Nomadix-enabled networks allow users to transfer their devices to different locations while maintaining an online connection, facilitating profit opportunities for providers of each network. Having shipped more than 50,000 units globally in the past 10 years, the Nomadix access gateway is the market leader in monetizing access to the Internet at public venues. The NSE software was developed in-house, resulting in more than 100 patents in 15 unique areas of functionality required for public access networks. Nomadix’ Gateways have been deployed in a variety of Venues by companies such as China Netcom, Best Western, Hilton, Marriott, NTT-ME, Red.es, Korea Telecom, Reliance Telecomm, Motorola, Intercontinental Hotel Group and Starwood.